Your footings are in place and it’s time to build the block walls and columns. By following Your Building Schedule, you should have already done these things, and be ready to proceed. Have footings pass building inspection. 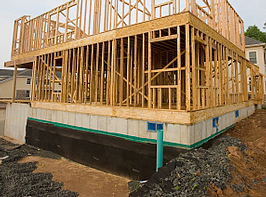 Give your foundation plan to a sales representative of a concrete block supplier. He will figure the amount and type of block that you need, and the amount of mortar and mixing sand. If you will have brick veneer walls, make sure he knows that, as that affects the type of block used. This will also require the use of “brick ties.” Once figured, have all of this delivered to the job site immediately. 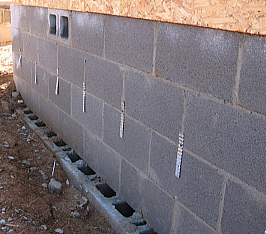 Be sure to include “anchor bolts” which add strength to the connection between concrete and the framing to come. If building code requires ground cover within the block walls, such as crushed stone, this is the time to order it. Hire a waterproofing contractor. You should have the block sealed soon after the masons finish. As soon as the block, mortar, and sand are on site, the mason can begin. Check with him daily to make sure he has everything he needs.